Our Impact — Lower East Side Coalition Housing Development , Inc.
LEScoalition has a small core staff of stable and experienced employees who add depth to organizational capacity. The agency has successfully managed programs and budgets for contracts with the NYC Housing Preservation and Development, NYC Community Development Agency, NYC Child Development Agency, NYC Department for the Aging, NYS Department of Housing and Community Renewal, HPD-LISC/Enterprise, the New York Community Trust, NYS Neighborhood Preservation Program, NYC Department of Business Services and a range of other private and corporate funders. LEScoalition was one of the founders of the Lower East Side Latino Human Services Consortium which included the Roberto Clemente Family Guidance Center, Betances Family Health Services, Andrew Glover Youth Services, Action for Progress, Loisaida, Inc, Pueblo Nuevo Development Corporation and CHARAS Community Center. LEScoalition was the original fiscal conduit and provided office space for the Lower East Side Girls Club, the first Girls Club established in NYC. LEScoalition has received continuous funding since 1978 from the New York State Division of Housing and Community Renewal and has Neighborhood Preservation Company designation of approximately 50 blocks. In partnership with the NYC Housing Authority and the US Department of Housing and Urban Development (HUD), LEScoalition co-sponsored three projects: Mariana Bracetti, Campos Plaza and Coalition Houses. 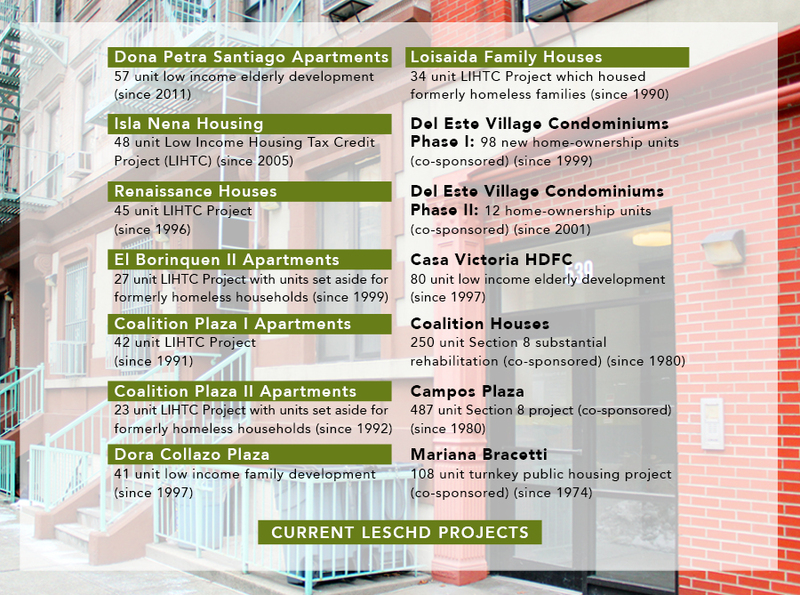 Under the NYC Housing Partnership/ New Homes Program, LEScoalition developed two projects: Del Este Village Condominiums Phase I and II. LEScoalition serves a low and moderate income population in a densely populated and rapidly changing socio-economic landscape. The mission of LEScoalition remains relevant and particularly important in an area with rapidly shifting demographics, diminishing development sites and existing affordable housing stock. Specific populations served are formerly homeless families referred from the Tier I and II shelter program operated by the NYC Human Resources Administration and the NYC Department of Housing Preservation and Development. Small numbers of apartments have been set aside in buildings for doubled-up families also known as the hidden homeless. There are also units assigned to a local agency to serve their developmentally disabled clients. Casa Victoria Housing for the Elderly opened in 1997 with 80 units of new apartments for seniors. An additional federal 202 senior housing project, Doña Petra Santiago Apartments, opened in August 2011 providing an additional 57 units of affordable senior housing.